A film maker, a singer, an artist. In 1981 he bought the Spiegeltent het Danspaleis from Anton van Zwetselaar. Now he had his own venue to perform in with one of his bands 'De Roomsoezen'. 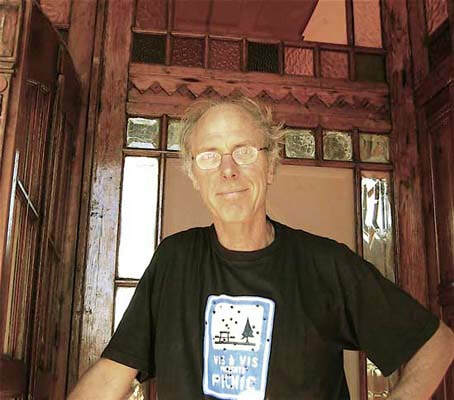 He travelled with Terts Brinkhof, Koen Vollaers en Willem Hol throughout the country with the 'Boulevard of Broken Dreams', a traveling theater and music festival, the forerunner of the 'Parade'. After the Boulevard went bankrupt Flip started to go more abroad with the Spiegeltent. It brought him to Germany, Austria, Switzerland, Denmark, the UK, Ireland, Canada and later to New Zealand and Australia. "Around 1966 I saw the Bosco Theatre for the first time on the ‘Nieuwmarkt’ in old Amsterdam. My girlfriend was performing in the mime group of Wil Spoor and naturally I went to see her. I was enchanted by both her and the charming little circus tent that added so much intimacy and atmosphere to the performance." 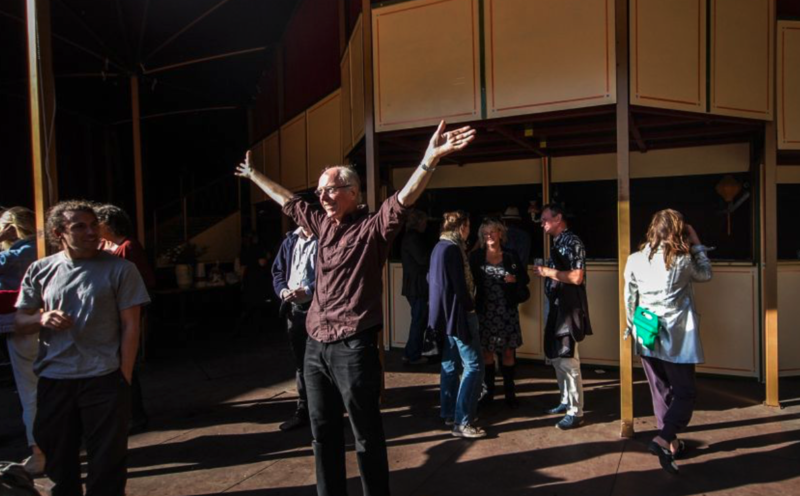 "Thirty five years later, now already an owner of a spiegeltent for twenty years, the Bosco Theatre finally finds a home with me. I give the love of my youth some tender care and rebuild the seating. The Bosco once again sails across the waters, not on a canal boat, but in a containership across the world!" "My experience with the Bosco Theatre and the Danspaleis along with the many other mobile structures I have seen and built with colleagues all over the world has convinced me of the value and the joy of these structures. It is of importance to conserve, adapt and evolve this tradition in the future". At the age of ten Berber surprised everybody by a drawing she made of the danspaleis. A longitudinal section of the spiegeltent (het danspaleis 1908) showing the stage section, dance floor, the huge luster, the boothes, folding tables and chairs, front porch, picturing herself in the box office. It was all amazingly accurate in its details and showed her perception and above all her deep interest in the thing. Especially in Wellington New Zealand, where we were invited for the New Zealand Festival of the Arts in the magical year 2000, she must have gathered all that information as the Jansen family frequently attended the shows. But it was getting more and more impossible to keep the Danspaleis on the road and to meet up with the every year growing list of official demands, adding the many more newly made spiegeltents by colleagues. Berber was deeply sad when the Danspaleis was sold in 2010 to Austria, where its rich interior will be used for the decoration of a museum lobby. Altogether the Danspaleis has been traveling for more than a hundred years and the last owner, Flip Jansen, has build it over two hundred times and has seen three continents. Fortunately Berber's love for the tents survived and she has been showing her skills in the tentworld constructing many different festival venues and of coarse traveling with her own Bosco Theatre (1909) and with the newly build: Corona Theatre ​(2012), the new big sister of the Bosco. As Flips daughter, Berber grew up in the middle of the tent industry. It became her dream to take over Flip's business. The first time she came along to learn how to build the tent she was only 16, but dedicated and worked hard between the other tent-builders. Before she entered the tentworld completely she studied for four years to become a history teacher and joined the woman's national baseball team. But when the tent was somewhere in Europe she would come along to build and learn. It was a destiny she had to follow and finally in 2014 she became officially Flip's companion and they changed their name to v.o.f. Danspaleis. ​Berber travelled many times to the UK with the Bosco and to Germany and Switzerland with the Danspaleis. When the Danspaleis had to make place for the Corona theater she soon travelled along with Luc Brinkhoff to the Garden of Unearthly Delights in Adelaide, Australia.